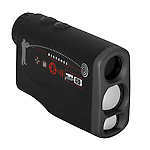 ATN AMT optical range finders lets you quickly and accurately judge your distance from the pin. ATN AMT optical range finders are a hit. The LaserBallistics Digital Rangefinders features Bluetooth connectivity that can be used with any rifle scope via the ATN Ballistics mobile app or directly paired with an ATN Smart HD Scope. Once your target's range is measured, the rangefinder dictates, either to the app or to the Smart HD Scope, how to adjust your rifle's turrets to compensate for distance and environmental factors.